Cisco launches the industry first secure internet gateway (SIG) in the cloud with an intention to address the security requirements of todays; mobile, cloud-connected enterprise. 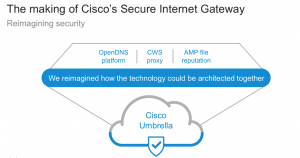 And Umbrella happens to Cisco’s Secure Internet gateway product. In past, organisations contained their services like email, software , ERP, HR solutions mostly into their own network perimeter, however with then advent of cloud things have changed. These days organisations are adopting software-as-a-service products such as WebEx, Office 365, Salesforce, Box and Google Docs and relying on them to improve their productivity and at the same time they are aiming to reduce their OP-EX. Even, these days most of the branch offices are directly connected to Internet instead of backhauling their internet traffic to corporate. Well all these new adoptions always raised security concerns, as one can work even without connecting to VPN and its predicted by 2019 there will be 70% increase in SaaS app usage. All these concerns are helping in evolving new security technologies and approaches, which are becoming more cloud centric. With launch of Umbrella, Cisco wants to address the problem of security over the cloud, with this new service Cisco wants to provide safe and secure access from anywhere and everywhere to their customers, even when they are off the VPN. 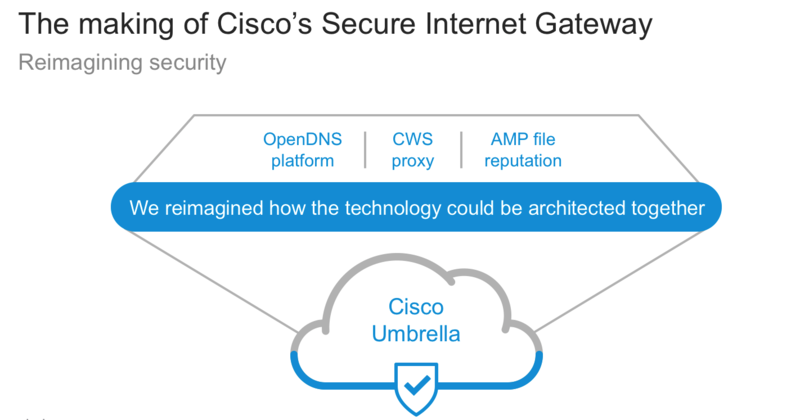 After acquiring OpenDNS in 2015, Cisco reengineered it with their own security portfolio to create Cisco Umbrella which can be described as the industry’s first Secure Internet Gateway. Cisco built this solution from OpenDNS Umbrella as the foundation, and brought together capabilities from the Cisco Web Security proxy and AMP file reputation and integrated them into this new platform. In future they are planning add Threat Grid sandboxing as well. Cisco says that the Secure Internet Gateway delivered from cloud is capable of providing safe and secure access, can acts as the first line of defense and inspection. 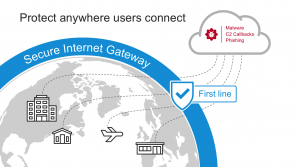 The Secure Internet Gateway can prevent current and emergent threats also at the same time can block access to malicious domains, URLs, IPs and files before a connection is established or a file downloaded.